Come September, a traffic-choked stretch of Laguna Canyon Road will be enriched by another mural to soothe the harried. Another mural already embellishes the side of a former administration building on the main campus. It did not require Arts Commission approval. Works visible to the public are considered public art and do need commission sanction, city arts manager Sian Poeschl said. The planned mural on the Suzanne Chonette Senior Studios will be the third visible mural on a short stretch of the canyon, joining Wyland’s gargantuan whale and “Wonder,” created by Mia Tavonatti and her students as part of an LCAD mural painting class. “Wonder” replaced a mural painted out in 2012 by the owners of the Laguna Canyon Winery, which sparked a community outcry. The artist invited the community to submit their ideas for a single word that evoked the town. The contest yielded “Wonder” and its interpretation writ wall sized. Artist Tim Robert Smith at work on one of the mural panels. Photo by Yuki Toy. The Senior Studio location was the college’s second choice. 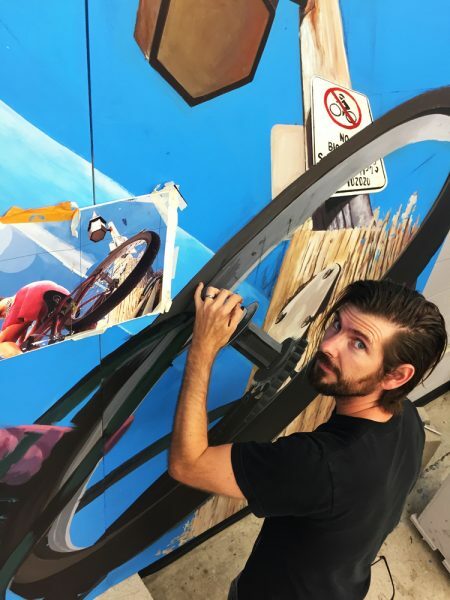 The initial application sought approval for a mural installation at 2245 Laguna Canyon Road on the north facing wall of a building housing light industry, explained Mark K. Day, LCAD’s director of campus facilities. Representatives of the owner, identified in public records as Urie Properties Inc., apparently expressed ambivalence about the project. “We would not want to launch this project without 100 percent support of all involved….” wrote Day to the Arts Commission. “We are still in discussion about 2245 and have not completely ruled out that location. But, with the calendar looming forward, we wanted to start work,” he said. In an interview, Carole Urie described the planned mural as a beautiful work of art. “I am excited about it, no matter where it will be installed,” she said. Day said framing for the 10 x 33 foot mural, consisting of eight panels, would be the same at either location. Both locations are equally advantageous to the school and public, he said. Having the mural on campus will keep it under the school’s jurisdiction and easier to maintain and change out at will. Installing it across from the studios will take advantage of an expanse of white wall and give incoming drivers something beautiful to glimpse. Smith’s public murals embellish walls in the Los Angeles area, creating a portfolio that lets viewers see the world from vastly different perspectives. “Upside Down…” gives viewers a worm’s eye view of large figures, Laguna sites and signage in a setting that resembles a spacial labyrinth. In the vein of MC Escher meets Salvador Dali. Time has slowed, viewers see as a young child might see. He calls his stylistic invention “multi-dimensionalism” and regards the surreal work of Robert Birmelin as contemporary inspiration. Extensive study of physics helps him understand and interpret multiple dimensions, he said. Smith emphasized that the mural is made to last, painted with highly durable Nova colors and sealed with external varnish to stave off the elements and taggers. “My goal is to inspire people to see things from different vantage points, something other than their own perception of reality,” he said.